Hakone Kowakien Yunessun is a hot spring amusement park and a spar resort in Hakone, [W:Kanagawa Prefecture]. 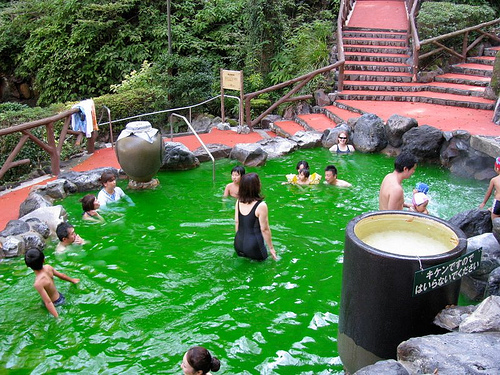 The mountainous town is famous as a traditional onsen (hot spring) town, and one of the closest spa towns to Tokyo. 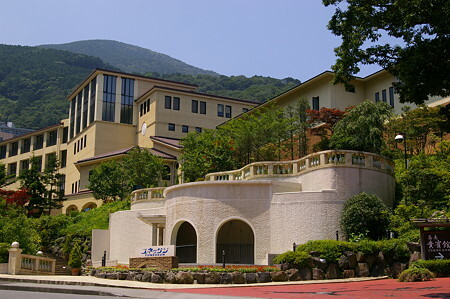 In the resort, there are three spa areas; yunessun, yutopia, and mori no yu. Yunessun is themed Aegean Sea and has eight kinds of Jacuzzi, floating bath, doctor fish foot bath, rodeo mountain slide, wood deck bath, Roman bath, inside and outside pool recreation for children and more. Yutopia is an open-air bath area in a valley. 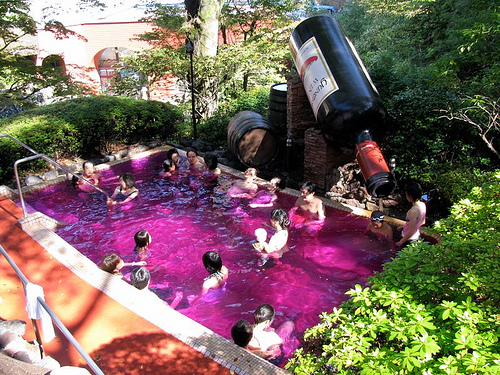 Surrounded by woods, the area has unique outdoor baths such as sake bath, wine bath, and green tea bath. Mori no yu is a traditional Japanese style hot spring area, with cypress bath, rotten buro outdoor bath, taru buro (large cast bath tub) and so on. Unlike the other two areas, you are not allowed to wear your bathing suits there. Hakone Kowakien Yunessun is now having special event featuring the winner of the Manga Grand Prize 2010, “THERMAE ROMAE,” which is about an ancient Roman (Hadrianus era) bath engineer, Lucius who transports through time and goes to today’s Japan, and learns the Japanese style bath. (I have written “THERMAE ROMAE” review.) 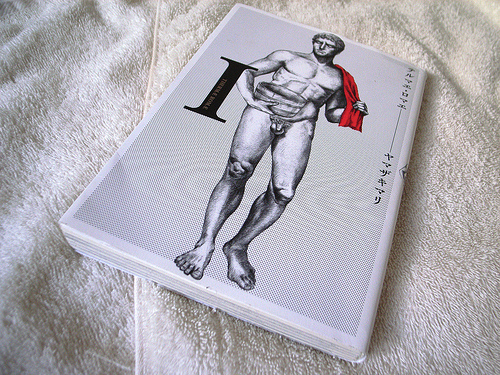 During the event, there are waterproof “THERMAE ROMAE” books and panels of Lucius at the ancient Roman bath. The event will be held till the end of this year. You can learn more about Hakone Kowakien Yunessun at tunessun.com (English).